October is already halfway over and we’re still getting such an odd variety of films because half of them are biopics and the other half are horror movies and this week we get one of each and one that is sort of both. But at least we have two movies from true filmmaking auteurs in Steven Spielberg and Guillermo del Toro, so we’re at least going to have some quality films this week. 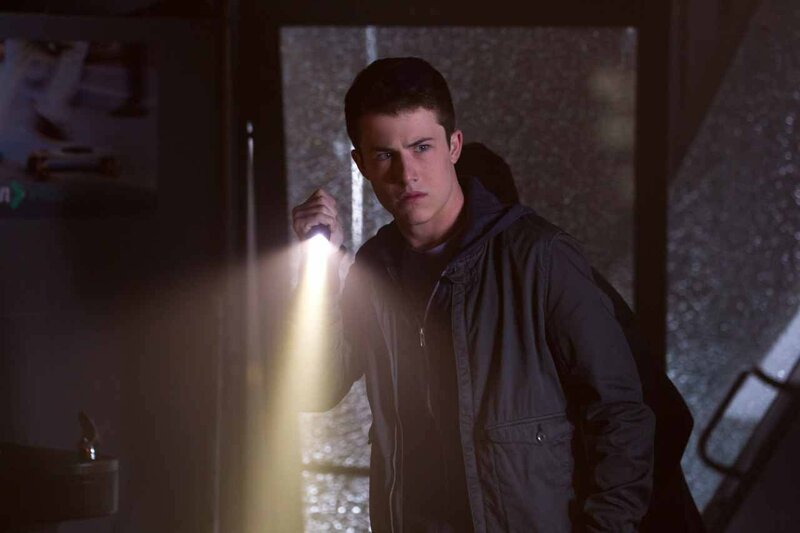 What It’s About: When teenager Zach Cooper (Dylan Minnette) moves into a new house in the suburb with his mother (Amy Ryan), he’s intrigued by the cute girl Hannah (Odeya Rush) that lives next door to him. Zach and his unlikely friend Champ (Ryan Lee) sneak into her house (thinking she’s in danger), and they find a bunch of locked manuscripts in the basement which turn out to be the works of her father R.L. Stine (Jack Black), author of the bestselling “Goosebumps” series. When they open one of the locks, the monster inside escapes joined by the evil ventriloquist dummy Slappy, who decides to cause mayhem by releasing all of the other monsters from R.L. Stine’s books. Just weeks after Sony released their hit animated family comedy Hotel Transylvania 2, they’re setting things up for another potential family horror franchise by bringing R.L. 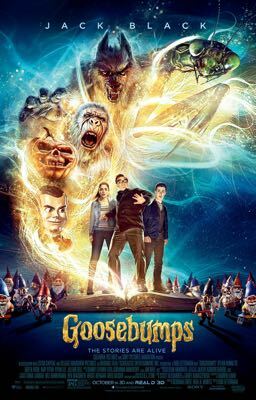 Stine’s popular bestselling kid’s books “Goosebumps” to the screen with Jack Black playing his own comedic version of the author in a horror-tinged action-adventure that harks back to the Spielberg Amblin films of the ‘80s and ‘90s. Stine’s “Goosebumps” series included 62 books between 1992 and 1997 and numerous spin-offs that have sold over 350 million books worldwide, translated into 32 languages. Clearly, Sony is hoping that this could be their “Harry Potter” rather than their Cirque du Freak: The Vampire’s Assistant (a similar movie adaptation that came out in October 2009 and grossed an abysmal $13.9 million domestically). Although Jack Black hasn’t quite become the box office star some may have been expecting after his earliest hits School of Rock and Shallow Hal, he’s generally done better with family-friendly movies like DreamWorks Animation’s Kung Fu Panda and its less successful sequel. (The character will be back in January’s Kung Fu Panda 3, which should be a good test to see whether the character still flies with American audiences.) In recent years, he’s been doing indies like Bernie (which reunited him with Richard Linklater) and the Sundance comedy The D-Train, which bombed even with a wide release and grossed less than a million dollars. The rest of the cast doesn’t bring much although Dylan Minette, Odeya Rush and Ryan Lee are all young stars on the rise. Minette has appeared on the hit ABC drama “Scandal” while the Israeli-born Rush appeared in The Giver and We Are What We Are and has been getting a lot more work in recent years. Playing one of the supporting comedic roles, Jillian Bell is also gearing up to become a huge star after her appearance in last year’s comedy hit 22 Jump Street and her upcoming role in The Night Before. But more than anything, Sony has the namebrand value of Stine’s books to sell the movie on and they’ve been doing that with a heavy marketing campaign that started all the way back at San Diego Comic-Con in July 2014 where they first showed footage in a fairly small setting. That led to a tour across the country with lots of preview and promo screenings as well as a panel at this year’s heavily-attended Book Con and appearance by Black and the cast at this past weekend’s New York Comic Con. The release date has been shuffled—at one point even to 2016–presumably to give director Rob Letterman (who teamed with Black for the failed Gulliver’s Travels) more time to work on FX, but apparently he didn’t need it and they jumped onto this prime pre-Halloween date in mid-October. The proximity to Halloween should help Goosebumps in the same way it did Hotel Transylvania 2 since families with kids are already gearing up for Halloween. The presence of Black and the monster elements could convince a teen and slightly older audience to check it out although one would expect horror fans over a certain age will probably go for Crimson Peak instead this weekend. Goosebumps should be good for an opening in the high $20 millions although I wouldn’t be even remotely surprised if this opens over $30 million as the fans of the books, both kids and their parents, should drive the business this weekend, and it should be able to hold up well over the next few weeks until the release of The Peanuts Movie. What It’s About: The latest from horror master Guillermo del Toro is a gothic horror romance starring Mia Wasikowska as Edith Cushing, a young woman who falls for the handsome Thomas Sharpe (Tom Hiddleston), who brings her home to his mansion that seems to be alive with the spirits within. With Halloween just weeks away, it won’t surprise anyone that the horror movies are starting to come at us hot and heavy, but Crimson Peak is the first movie from Guillermo del Toro in over two years as well as his first horror film since Pan’s Labyrinth, which came out nine years ago, winning three Oscars. In that time, Del Toro has been producing a lot of great horror films for other filmmakers like Juan Bayona’s The Orphanage, Andres Muschietti’s Mama as well as Splice, Julia’s Eyes and the remake of Don’t Be Afraid of the Dark. Obviously, there are few filmmakers who are in tune with what international horror fans want to see and what is effective at scaring the pants off of moviegoers, so taking on a gothic period film and an R-rated one should be just what horror fans want right now. 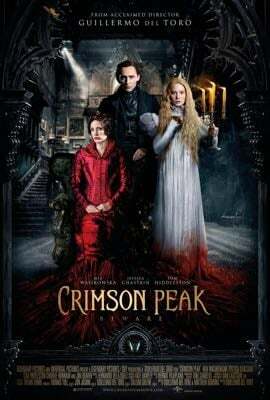 Crimson Peak has another thing in common with Mama besides both being released by Universal and that’s the presence of Jessica Chastain, who helped the latter open in January 2013 to the tune of $28 million before going onto $71 million domestic gross and about the same internationally. Even more of a draw than Chastain may be the popular Tom Hiddleston, whose turn as Loki in Marvel Studios’ movies have helped him build a huge female fanbase, which crosses over nicely with women who might be interested in a gothic horror-romance. The rest of the cast isn’t anything to scoff at as Mia Wasikowska has appeared in quite a few chilling films, including Cary Fukunaga’s Jane Eyre (a novel that was hugely influential on del Toro’s film) as well as Park Chanwook’s Stoker, so her casting in this movie isn’t too odd. Also, Del Toro has brought back Charlie Hunnam, the star of his monsters vs. robots epic Pacific Rim, which opened with $37.3 million in 2013 and grossed $101 million domestic and $300 million internationally. With such a strong cast, Universal and Legendary Pictures (the latter who produced Pacific Rim but released it through Warner Bros.) won’t have to rely on Del Toro as much to bring in the genre fans, but there’s little question that his name will be a fairly big draw as his previous action films like Blade II, Hellboy and its sequel (the latter released through Universal) have done well because Del Toro has fans who know that he’ll always deliver something they’ll enjoy. As mentioned above, Crimson Peak is a rare R-rated movie in a month that’s been dominated by PG and PG-13 releases, although these days, ratings don’t seem to matter much to anyone other than parents with young kids. While the R rating could impede younger teens from checking it out and scare away an older audience, there should be a pretty decent range of audience from 15 to 35, both male and female, who will give this a look over some of the weekend’s other choices. 2015 hasn’t been a particularly spectacular year for horror at the box office with M. Night Shyamalan’s The Visit grossing more than $60 million and Insidious Chapter 3 doing about $50 million but nothing else really breaking out. That puts a little more strain (ha ha) on Del Toro for Crimson Peak to succeed since it probably is more expensive than all of Blumhouse Productions’ 2015 releases put together, although it’s been well-marketed with big pushes at Comic-Con this year and last. Granted, the title lacks the descriptiveness necessary to sell an original premise not based on an existing property or source material, but hopefully the marketing has made up for it. It probably doesn’t help that Del Toro has taken to social media to claim that Crimson Peak isn’t a horror movie at all, but rather a “gothic romance,” as that seems counter-intuitive to Universal’s marketing. It’s October and however much Guillermo del Toro is trying to underplay Crimson Peak as a horror movie, the fact it’s being marketed as a horror movie should help it do decently, probably in the $17 to 19 million range. I wouldn’t be remotely surprised if it gets into the low $20 millions with horror fans so thirsty for scary fare in the weeks leading up to Halloween. It has some direct competition next week with the latest Paranormal Activity, but it seems like $50 million is attainable domestically and the film should do incredibly well overseas as well. What It’s About: When an alleged Soviet spy Rudolf Abel (Mark Rylance) is caught by the FBI, lawyer James Donovan (Tom Hanks) is brought in to defend him, but James soon becomes embroiled in Cold War politics when he’s asked to go to East Berlin to negotiate the exchange of Abel for a downed Air Force pilot caught by the Soviets. It’s been three years since we got a movie from the usually-prolific Steven Spielberg, that being the historic drama Lincoln, starring Daniel Day-Lewis, who won his third Oscar for his performance in that film. (Thankfully, we’ll get more Spielberg over the next couple years with his adaptations of The BFG and Ready Player One.) Bridge of Spies is a spy thriller that pairs Spielberg with his frequent collaborator Tom Hanks for the first time (at least as director and actor as opposed to co-producers) since 2004’s The Terminal. That film grossed $77 million domestically with a summer release and that’s despite middling reviews at best. Their previous movies together, 2002’s Catch Me If You Can and 1998’s Saving Private Ryan, grossed $164 million and $216.5 million, respectively. Spielberg is generally one of the most successful filmmakers in Hollywood although his biggest and most lasting hits were in the ‘70s and ‘80s with Jaws, Close Encounters of the Third Kind, Raiders of the Lost Ark and E.T. the Extraterrestrial all being enormous blockbuster hits. (The latter grossed $435 million in 1982 and 1983 which is huge considering how much cheaper movie tickets were at the time.) Spielberg has continued to have hits even if he’s gotten less prolific and even the historical drama Lincoln grossed $182 million domestic thanks to the awards attention it got. Bridge of Spies probably owes more to that than some of Spielberg’s other movies, especially the ones that delved into the world of science fiction, but it also doesn’t seem to be getting as big a push by Disney (who distributes DreamWorks) as either Lincoln or its predecessor War Horse. In fact, you’ll be hard-pressed to find that much with either Spielberg or his star, who have kept their press to a relative minimum compared to previous films. Hanks is probably as much as a draw as the director with many $100 and $200 million blockbusters (the most recent of the former being 2013’s Captain Phillips) and then when you add his animated work in Pixar’s Toy Story 3, that’s $400 million domestic right there. His collective movies since 1984 have grossed over $4 billion in North America and twice that amount worldwide. 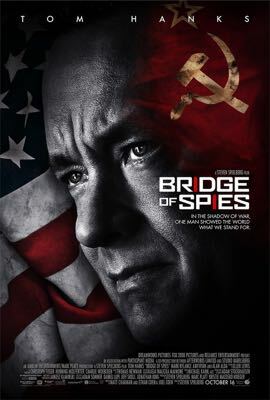 So clearly, pairing Spielberg and Hanks should be good to bring in fans of their earlier movies except that Bridge of Spies is a conspiracy thriller that doesn’t seem to be marketed as if it’s something very exciting that needs to be seen in theaters. It’s actually reminiscent of the 2007 movie Breach, starring Chris Cooper, which opened with just $10 million and grossed $33.2 million total, but that’s without Spielberg and Hanks. Bridge of Spies premiered at the New York Film Festival recently and reviews have generally been good with 91% on Rotten Tomatoes and the older audience for the movie does let reviews influence their movie habits, but Bridge of Spies just doesn’t seem like it’s gotten as much of a push as the other movies being released this week or even Ridley Scott’s The Martian, which will still be bringing in the same older adults that might be interested in this. If this movie didn’t star Tom Hanks and wasn’t directed by Steven Spielberg, it probably wouldn’t do very well because it just hasn’t been marketed as something that mainstream audiences might be interested in seeing. Because there are older adults looking for films to see and Bridge of Spies does have the quality that comes with a Spielberg/Hanks movie, that should allow this to make between $14 and 16 million this weekend on its way to $60 million or slightly more. Also opening wide this weekend is a spiritual football drama called Woodlawn (Pure Flix Entertainment) by “the Erwin Brothers” and starring Sean Astin and Jon Voight. Frankly, I know next to nothing about it nor do I ever have any sort of barometer for these faith-based films and how they’re being marketed, so I don’t have a lot to say about it… and I won’t. The weekend’s big winner was David Ayer’s war movie Fury (Sony), starring Brad Pitt and Shia Labeouf, which opened with $23.7 million in 3,173 theaters for first place. Gone Girl dropped one notch to second with $17.5 million and the Guillermo del Toro-produced animated film The Book of Life (20th Century Fox) took third with $17 million in 3,069 theaters while the latest Nicholas Sparks adaptation The Best of Me (Relativity), starring James Marsden and Michelle Monaghan, bombed with just $10 million, opening in fifth place. The Top 10 grossed $115 million and this weekend could be up slightly with the three stronger offerings. Goosebumps shouldn’t have a problem dethroning Ridley Scott’s The Martian and then Crimson Peak and Bridge of Spies will probably divide audiences, although I’ll give an advantage to the former since it skews younger and has the advantage of being a horror movie being released in October. Danny Boyle’s Steve Jobs is expanding this weekend but only into 60 theaters or so, which might not be enough to break into the top 10. UPDATE: No major revelations, just a few tweaks. It’s a smorgasbord of crap. Other than Danny Boyle’s Steve Jobs (Universal), starring Michael Fassbender, which will expand nationwide, we’re getting Vin Diesel as The Last Witch Hunter (Lionsgate), we get Bill Murray as a rock manager in Rock the Kasbah (Open Road) although oddly, he’s not managing Jem and the Holograms (Universal). And because it’s almost Halloween, the scary movie franchise is back with (no, not the Wayans comedies)… Paranormal Activity: The Ghost Dimension (Paramount). 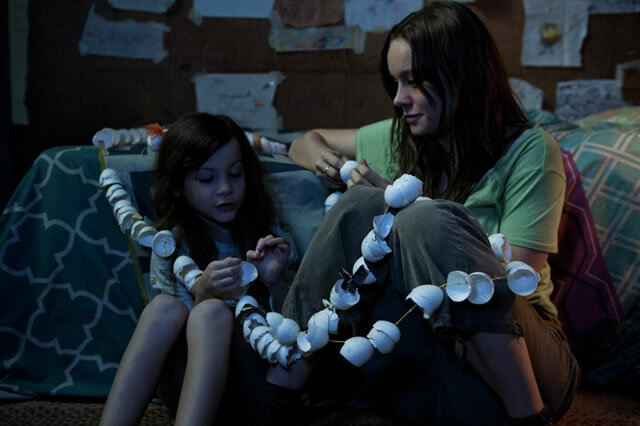 What It’s About: After being kidnapped at the age of 17, a young woman (Brie Larson) has been trapped by her kidnapper in a garden shed for years and five years after giving birth to a son Jack (Jacob Tremblay) she decides it’s time for them to escape. This was one of the best movies I saw at the Toronto International Film Festival and after seeing it a second time, it’s almost guaranteed to be one of my Top 5 movies of the year. It was little surprise when it won the festival’s Grolsch People’s Choice Awards either, because it’s really quite a moving and emotional film. What It’s About: Based on former CBS News producer Mary Mapes’ book “Truth and Duty,” it follows Mapes (played by Cate Blanchett) as she puts together a story for newsman Dan Rather (Robert Redford) that proves that then-President George W. Bush shirked his duties to the National Guard during the Vietnam War, based on documents that may have been falsified. Their inability to prove the documents to be valid ends up causing trouble for Rather and Mapes who were investigated by CBS and eventually fired. What It’s About: Actor Colin Hanks makes his directorial debut with this amazing doc that tells the history of my former shrine, the record store chain Tower Records, which was found in 1960 by Russ Solomon who built the chain into a billion dollar industry by1999 only to seven years later be filing for bankruptcy as the doors of their stores were closed forever. It will open in New York and L.A. on Friday and be available on VOD. What It’s About: Agu (Abraham Attah), a young boy in an African village caught in the middle of a civil war is recruited by the Commandant (Idris Elba) to join his army of child soldiers, which makes this adaptation of Nigerian author Uzodinma Iweala’s novel by “True Detective’s” Emmy-winning director Cary Fukunaga a very different coming-of-age film than we’ve seen before. What It’s About: The latest Chinese period film from China’s master filmmaker Hou Hsiao-hsien is an action film starring his frequent leading lady Shu Qui as Nle Yinniang a young woman who was abducted and trained in the martial arts by a nun only to return 13 years later to the land of her birth as an assassin to confront her past. It opens in New York and L.A.
What It’s About: An anthology of ten short films by some of horror’s top directors about suburban neighborhoods being terrorized on Halloween night. Apparently After Dark Films is back with their 8 Films to Die For on Friday as well and you can find out where you can see those 8 films on the official site. What It’s About: Married couple Sarah and Phil (Olivia Wilde, Luke Wilson) suffer a terrible loss that make them change their ways as Phil, a New York City policeman starts losing sight of his morals and Sarah puts herself into dangerous situations. Reed Moreno’s film, which premiered at the Tribeca Film Festival earlier this year, will open in select cities and be available on VOD starting Friday. What It’s About: A drama based around the 1961 Yale-based psychological experiments by Stanley Milgram (Peter Sarsgaard) that made people think they were delivering painful shocks to a stranger (Jim Gaffigan) in the next room. Although he was pleading for them to stop, the desire to follow orders keeps them from listening. It opens in New York, L.A. and Toronto on Friday as well as On Demand. You can find a full listing of theaters here. What It’s About: A look at Misty Copeland, the iconic ballerina who became the first African-American woman to become a principal dancer at the American Ballet Theater. It opens in New York on Friday including the IFC Center where Copeland will appear to answer questions after the movie. What It’s About: Olga Kurylenko and James Purefoy (“The Following”) face-off in this action-thriller about an infiltration expert (Kurylenko) who gets caught up in a government conspiracy after a routine heist that pits her against a master assassin (Purefoy). What It’s About: At four years old, Ukranian artist Fedor Alexandrovich suffered from radiation poisoning following the Chernobyl disasters in 1986 and now at 33, he goes looking for those responsible. It opens in select cities and On Demand. You can post any comments or questions below, or you can get in touch with the Weekend Warrior on Twitter.